it's my preferred rehydrator when over there. They sell here in Wollongong. 21 degs and it's niiiiice . Just hitting Kiama now . won't be too much longer ! Still 31C in Sydney. We're in the spare room for the night as it has air con. Ground cooling has commenced. 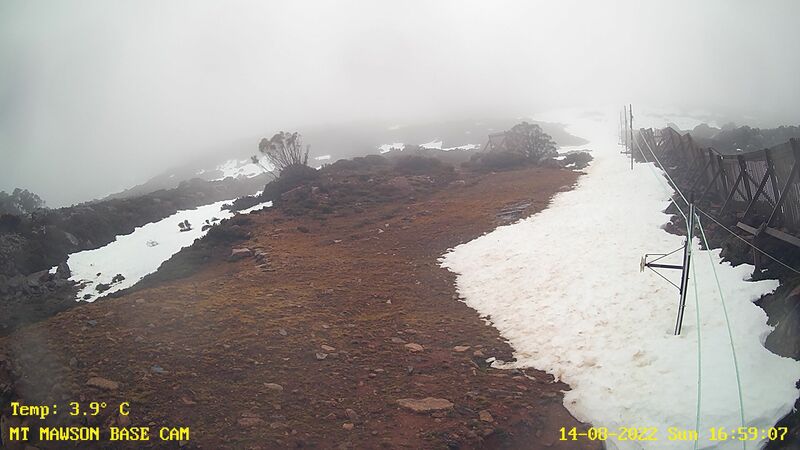 Mt Mawson cam. Jellybeans1000, MickM, filski and 14 others like this. 11:30 and waiting in redfern. Cant even imagine going to bed to try to sleep. Just arrived as I cracked open my last Pocari Sweat. I so miss living in Japan. I love Pocari sweat hoping it actually would be ok to drink regularly. So I did some research and found out that it is just sugar & salt. Basically another soft drink. Devo! A horrible windy day in Canberra with dust everywhere. Lady Penelope, is that a arena? No, just the view towards the Murrumbidgee corridor from my house in Kambah. A little different this morning .... the dust has settled. Jellybeans1000, dawooduck, whether and 3 others like this. Jellybeans1000, dawooduck, MickM and 10 others like this. Mt Tennant in the background. iirc. SMSkier, Seafm and POW_hungry like this. Mine looks like the moon. Five drops of rain with the change. 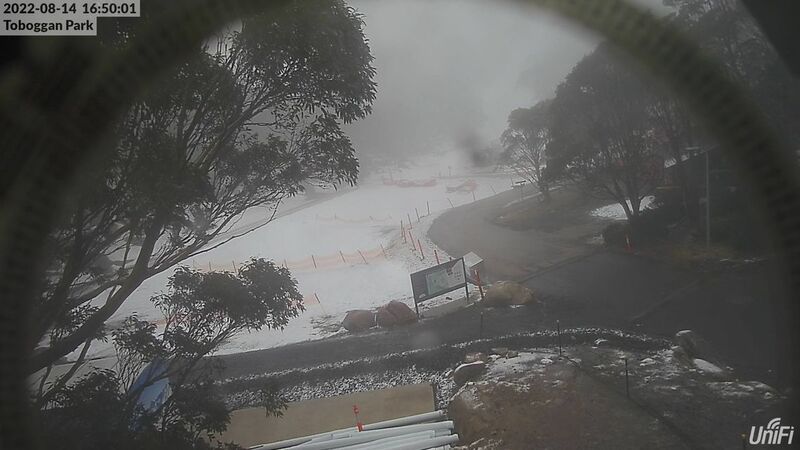 Dusting on Kunanyi, Tas overnight. Jellybeans1000, Ted Harper, whether and 7 others like this. A very pleasant 8c in Emerald this morning. 8.1mm rain in total yesterday. After the 10mm we had on saturday as well, garden is looking much refreshed. SMSkier, teckel and nfip like this. W0nkey D0nkey, SMSkier, Claude Cat and 1 other person like this. Tempted to turn the heating on here. Jumper not warm enough. Love it. Paddocks lovely and green. DiscoStuAU, Chowder11 and Snowy Joey like this. Go Mawson! Break out the toons! Hopefully plenty fell over the fire grounds down there as well! whether, dibl0c, DiscoStuAU and 7 others like this. Jacko4650, whether, POW_hungry and 1 other person like this. Cool on the NSW side of the mountains today. About 5 up top now and 14 or so in town. Still a stiff breeze lakeside but dust well and truly gone. Plenty of branches down as a result of the change yesterday. Jellybeans1000, Jacko4650, Snowy Joey and 6 others like this. Just saw their video on instagram. Some nice flakes falling. Claude Cat, whether and dibl0c like this. whether and dibl0c like this. filski and Edgecrusher like this. Would be very surprised if Bawbs reached there predicted max of 7! Still only 1c. Should see an uptick in the next few hours when the sun pops out. Jellybeans1000, SMSkier, Kletterer and 2 others like this. Don't laugh. This is perfect fodder for the nutcases who are banging on about the "grand solar minimum" pushing us into a "new ice age". Trail Blazer, Kletterer, rocketboy and 1 other person like this. Probably. The Cawthron institute may monitor that in NZ waters, they certainly make satellite obs that would provide a proxy. I'll potentially be involved in working out if it impacts our glaciers/permanent snow. Interesting timing in terms of sensitivity etc. Already a lot of dirty ice exposed, so maybe not much of an impact, but it's the hottest part of the year, so yeah even a small increase in forcing could be amplified, would have to do some maths on that one! Will need to wait and see if we actually get any signal in the satellite obs first. Majikthise, SMSkier, filski and 3 others like this. Would be stoked if you could keep us updated on findings. Snowy Joey and Jacko4650 like this. From a glaciological p.o.v., the data isn't particularly urgent, and it's all archived anyway, so yeah likely to be something that gets revisited down the track. filski and POW_hungry like this. Figured as much. When and if findings come about, if you can. I thought immediately about photoplankton but never thought to consider glacial impact on NZ. Simply curious on how Australian anoms directly impact NZ given it's downstream. Fascinating. The world is a connected place! One thing I've been interested in in my own research is the role of air masses originating over central Australia on NZ snow climatology in general. Problem is that given that is wnw of NZ, and almost all of our "wind" comes from the W half, it's pretty much impossible to detect any meaningful signal. The role of anomalous easterly air flow is much more readily apparent. Dust events like this, however, will hopefully be a bit easier to unravel. Major Australian fire events too, and that will certainly get some proper attention in due course. In Europe now they are able to, for example, determine the role that African dust plays in winter snow pack stability. Pretty interesting stuff. In the states, dust originating from the shrinking great salt lake is having a negative effect on the snow pack in Utah. The same occurs for the Rockies downwind of the deserts. Jellybeans1000, POW_hungry, DiscoStuAU and 5 others like this. I bet this event will be monitored. Worth a read. It’d be interesting to understand the scale of the dust storms then and now. We don't archive Himawari ourselves, (mostly use MODIS at this scale), but it'll be very rich data for this event. Could potentially provide an interesting case study for testing Lagrangian atmospheric transport models. What about dust from Australia and western Pacific cyclones. Is there a similar link as there is Africa and Atlantic hurricanes? Dunno. Don't think anyone's really looked at it too much. The more I think about it, the more I wonder whether it could lend itself to interesting chemical/isotopic analysis, if you find the right sampling spots. The difference is the - Sahara dust feeds directly into the equatorial Atlantic, whereas the Aussie dust streams into the south Pacific and is far less regular in occurrence. The teleconnections are truly incredible. That recent science paper on global rainfall paterns was quite interesting. Yeah, totally. That's why I wonder whether an isotopic approach might be a neat way to try and pin down sources and sinks, that's not so much my area though, but if someone could tell me where (if) it's accumulating, for example, in NZ, then it'd be fun to run the back trajectories and see how well we can predict the source - though that would be limited a bit by residence and travel time. Latest ENSO forecast from NOAA is out for Feb 11. There's a moderate warm Kelvin wave making its way across the Pacific again. Really hard to say which way it's going to go - we didn't see a big La Nina after the last big El Nino - which is unusual given past history. Quite cool this morning. Guess we can anticipate the occasional light frost between now and when the cold weather arrives (proper). Kletterer, Jellybeans1000, IAB and 9 others like this. Not fair SMSkier. It was 27.3 degrees last night here in Maryborough Qld at 11.30pm and got down to as low as 24.4 at 4am so we could all turn air-conditioners off for a few hours! Back up over 30 by 9am. Sick of it. Claude Cat, Jacko4650 and SMSkier like this.